I am in the process of building my first single speed and I recently picked up a Blackspire 32 tooth 104 BCD single speed chainring to use with a Shimano M542 Hollowtech II crank that I had laying around. After installing the chainring on the inside of the spider I immediately noticed that the spider sticks out beyond the ridge into the teeth of the chainring. I tested with a chain and sure enough the chain rubs the top points of the spider as the crank turns. 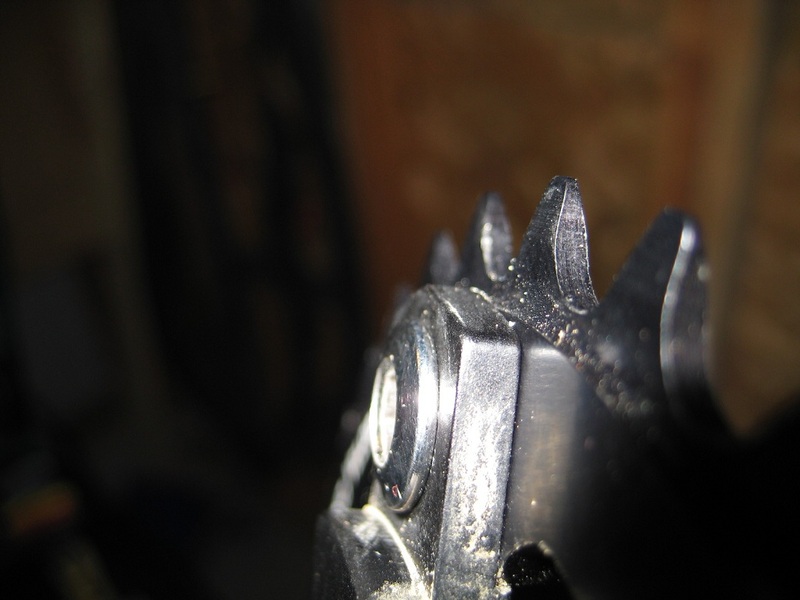 I then tested the same ring with an older XT crankset and the same issue occurred (pictured). I'd rather not wear a groove into the top of my spider if I can avoid it, has anyone else encountered this issue and if so how did you solve it? Do I need to purchase a different chainring from a different manufacturer? wow, that's really weird. The only thing you can do without grinding the spider down a little is get some chainring bolt spacers or something. I'd imagine it would loosen up on you though. Have you tried running the ring on the outer side to see if it may clear? Shimano should replace that as it is clearly an out of tollerance forging. I'd just get file and take off only enough to give you chain clearance - it's only five minutes work and isn't going to adversely affect the integrity of your crank. should you get Shimano to replace it under warranty, with a time frame of at least 2 weeks, or should you file it down in 5 minutes? TOUGH ONE. grind the sucker down and go ride. Thanks for the responses, I have tried the outer side and the same issue occurs. I think the cranks are ok since both the M542 and XT work fine with the stock Shimano chainrings without any clearance issues. I'm going to see if I can find a different 32 tooth chainring today and see if that changes anything but if they all have the clearance problem I'll break out the file. Moving the ring from the inside of the spider to the outside of the spider won't change the size of either the ring or the spider, so of course the situation will persist. As it will with any other ring of the same size. Grind the spider. I've done it before... no problem whatsoever. since it's forged, it could have a bit of a draft angle to it, which could be just enough to clear the chain. Longshot, but worth checking. I didnt know how off it was. For a 32 tooth sprocket I think it should be 121.64mm, measued diametrically from base of tooth to base of tooth (although ISAR will know more about this than me, I guess). At least then you could check if your sprocket was undersize or not, although even if it was, the chain couldn't follow the smaller rad. anyway. Does the chain that you are using have very deep sideplates ? yea, close enough. most side plates i've measured are nearly 1mm larger than the roller, so it would need to be about 120.5mm to clear the chain. edited: of course the oem rings are also spaced away from the spider arms. Last edited by aka brad; 07-03-2010 at 08:48 PM. Thanks - that (121.64mm) is what I'd work to anyway. I do have a 12th edition Machinery's Handbook somewhere around here but i havent opened it in years. I taped a copy of the triangle formula page to the back of my calculator and that's about all i need out of it. Damn us we lazy youth! I've got exactly the same problem on my rig. Just put two different rings on and both catch.